Introduction to Composites. Basic Solid Mechanics. Micromechanics of a Lamina. Macromechancis of a Lamina. Macromechanics of a Laminate. Analysis of Laminated Beams, Columns and Rods. Analytical Solutions for Laminated Plates. Finite Element Method in Laminated Composites. Reinforcements and Matrices for Polymer Matrix Composites. Manufacturing Methods for Polymer Matrix Composites. Testing of Composites and their Constituents. Non-Destructive Testing of Polymer Matrix Composites. Metal Matrix, Ceramic Matrix, Carbon/Carbon Composites. Design of Composite Structures. Manoj Kumar Buragohain is a scientist at Advanced Systems Laboratory Hyderabad (India). He obtained his BSc (Engg) degree in Civil Engineering from Regional Engineering College (REC), now, National Institute of Technology (NIT) Rourkela, India, in 1990. He received his MTech and PhD, both in Aerospace Engineering from Indian Institute of Technology (IIT) Madras in 1992 and 2010 respectively. He is also qualified in the field of finance and he received his PGDFA from The Institute of Chartered Financial Analysts of India (ICFAI) Hyderabad in 2000. He has over two decades of hands-on experience in design, development and production of composite products and technology development. His primary research interests are in respect of: geodesic and non-geodesic filament winding of axisymmetric and non-axisymmetric components, tape winding, rosette lay-up and contact lay-up. Some of his major design and developmental contributions have been in large size composite pressure vessels, filament wound grid-stiffened composite structures, filament wound tubular structures, ablative liners by tape winding and rosette lay-up, composite rotor blade for wind turbine generators, etc. He is a life member of Indian Society for Advancement of Materials and Process Engineering (ISAMPE), Aeronautical Society of India (AeSI), etc. He has about twenty papers in and chapter contributions to refereed journals and international & national conferences and edited monograms. His contributions to the field of composites have been recognized and he was awarded Laboratory Scientist of the Year Award (2009), National Science Day Commendation Certificate & Silicon Medal (2007) and DRDO Award for Performance Excellence as a team member (2012). "This book covers the mechanics, analysis, design, manufacturing and testing of composite materials and composite beams, columns and plates. The book is illustrated with solved examples and includes numerous exercise problems. A well-written book for engineers and students in the field of composite materials and structures." 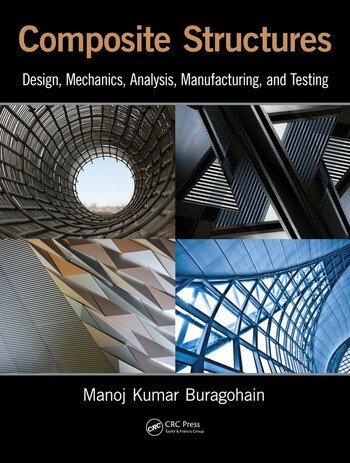 "Written by an expert in the field, this book provides a comprehensive and authoritative treatment of the subject, from basic mechanics, to manufacturing, testing, analysis and design of composites and composite structures. This book should appeal to both students interested in learning the behavior and applications of composites as well as professionals interested in expanding their knowledge on the subject." "This book provides a detailed information about the entire spectrum of composites from Design to Analysis to Manufacturing and Testing. This is a very informative compilation which is a true reflection of author’s rich experience in design and development of composite structures. A book which is clear, easy to read and insightful that provides extensive and adequate coverage of product development cycle. The presentation style is eloquent, timely and prescriptive. The book is contemporary and best explained with significant illustrations and exercise problems. The reader is guided through the book by book road map, chapter road maps and a reading plan. This book offers a wide spectrum of information which will be of great value to students as well as professionals."